Hvorfor betale for en kostbar cab ride når det er et enkelt, kostnadseffektivt alternativ tilgjengelig 24/7? 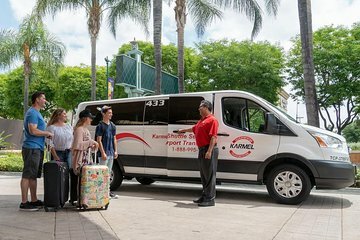 Bestill en delt ankomstoverføring fra Los Angeles Airport (LAX) til ditt hotell i Long Beach eller San Pedro. Stiger et skip etter flyet ditt? Ikke noe problem, denne overføringstjenesten kan ta deg til San Pedro cruise terminaler også. Transport er med aircondition med maksimalt ni passasjerer. Very smooth transfer from airport to cruise terminal. Every thing went as expected and followed the e-mail trail to the letter. Helpful friendly driver did a very good job. Much better than taking pot-luck off the street. We will use this service again! Great experience.Friendly and accommodating drivers.Highly recommend these people. Great service from LAX to Ling Beach! It took a little longer than indicated for pick up and drop off had an unexpected end but driver handled it well.